The Union Bank press release was issued as a result of the Union Bank settlement agreement negotiated by Lainey using Structured Negotiations on behalf of California blind advocate Margie Donovan. In the agreement, the bank agreed to install Talking ATMs at all its locations and implement a comprehensive alternative format policy. Union Bank of California had the first Talking ATMs in Washington State and Oregon. Subsequently, the bank also committed to make its website accessible. San Francisco, CA (December 6, 2001) — Union Bank of California, N.A. today announced installations of Talking ATMs in California, Washington and Oregon as part of plan to install Talking ATMs at virtually all of the Banks ATM Locations over the next eight months. UBOC becomes the first bank in the country to install full-service talking ATMs in Washington State and Oregon. The Bank also announced a broad plan to enhance access to its printed materials for persons who are blind and vision impaired. Talking ATMs provide audible instructions to persons who cannot view information on an ATM screen. These machines make it easier for visually impaired users to withdraw cash, deposit money, obtain account balances, and perform other transactions. 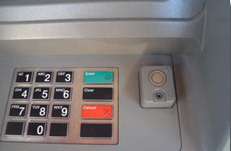 The ATMs have audio jacks that deliver spoken instructions privately to protect the security of sight impaired users. A member of the American Council of the Blind, Donovan has been actively involved in assisting UBOC in its efforts to improve services to the blindness community. Having full access to my bank gives me as both a blind individual and as a professional a critical sense of freedom and pride, she continued. “Union Bank of California deserves tremendous praise for being the first bank to bring talking ATMs to the states of Oregon and Washington,” said John Flemming, representative of the Oregon Council of the Blind, and Marlaina Lieberg, chair of the Environmental Access Committee of the Washington Council of the Blind. Both organizations are affiliates of the American Council of the Blind. We urge other banks doing business in these states to follow UBOCs leadership role in providing independent access for all customers to a wide array of banking services. According to Lainey Feingold, a California disability rights lawyer who has assisted members of the blindness community around the country regarding talking ATMs, the expanded UBOC services announced today will benefit the blindness community as well as all persons who have difficulty reading standard print. Seniors, persons with dyslexia, as well as persons who are blind or have vision impairments will now be able to independently access their financial information, a critical component to maintaining independence, she said. Providing talking ATMs is an essential aspect of serving our blind or visually-impaired customers with access to financial services. We consider these steps integral to our commitment to serving this community, said Richard Hartnack, vice chairman for Union Bank of California. UBOC talking ATMs will be equipped with universal audio jacks that work with headphones and the bank will also provide listening devices to persons with vision impairments. When an earphone is plugged into the jack, the listener hears private audio instructions for transactions typically displayed on the ATM screen such as cash withdrawals, balance inquiries, transfers & payments and deposits. Union Bank is upgrading existing ATMs to provide the audio feature. In the future, Union Bank of California will provide important financial materials including statements, brochures and other account information in formats which are better suited to the needs of the visually impaired such as Braille, audiocassette and large print. This aspect of the banks initiative is extremely important to the growing senior population as it seeks to maintain independent access to personal financial information. Based in San Francisco, UnionBanCal Corporation is a bank holding company with assets of $35.2 billion at September 30, 2001. Its primary subsidiary is Union Bank of California, N.A., the third largest commercial bank in California with 244 banking offices in California, 6 banking offices in Oregon and Washington and 18 international facilities. The Website is located at www.uboc.com. This document is the press release about the legal agreement that Union Bank of California signed with blind activist Margie Donovan. Lainey Feingold was the lawyer. No lawsuit was filed. Instead, a formal process known as Structured Negotiations was used. Union Bank of California agreed to install Talking ATMs, and give blind people braille bank statements. The bank will also give Large Print and audio versions of print information. The bank also agreed to give blind people headphones for the Talking ATMs. Union Bank of California had the first Talking ATMs in Washington State and Oregon. Subsequently, the bank also committed to make its website accessible.